In March 2017, a salvage excavation was conducted c. 0.5 km southwest of Horbat Zanoah, in the eastern part of Ramat Bet Shemesh (Permit No. A-7966; map ref. 200062-6/624972-7; Fig. 1), prior to construction. 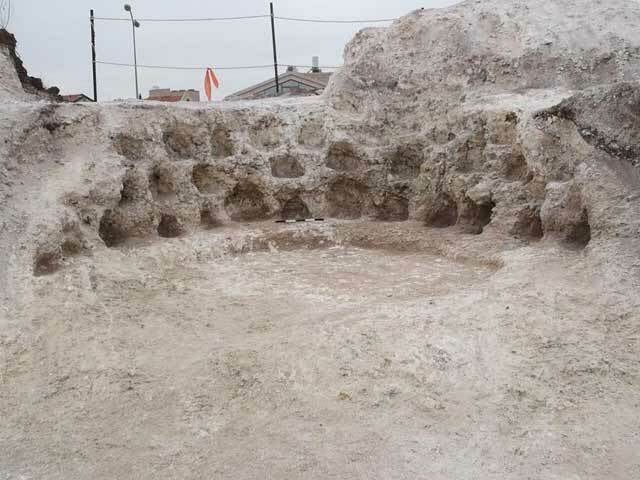 The excavation, undertaken on behalf of the Israel Antiquities Authority and financed by A. Carmel, was directed by M. Balila, with the assistance of N. Nehama (administration), M. Kahan (surveying), A. Wiegmann (photogrammetric documentation), O. Rose (drafting) and T. Shadiel (archaeozoology). 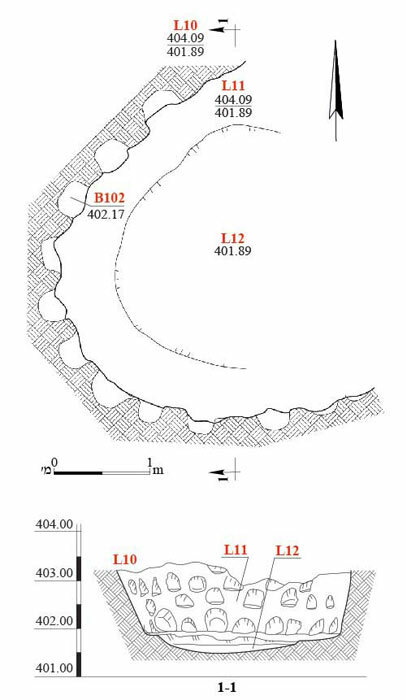 The excavation area was first surveyed as part of the Ramat Bet Shemesh survey project at which time winepresses, agricultural terraces and a bell-shaped cave were identified (Dagan 2010: Site 265). In another comprehensive survey, performed in anticipation of future development, ruins were discovered that included rock-hewn installations and architectural remains (Nagorsky 2008). 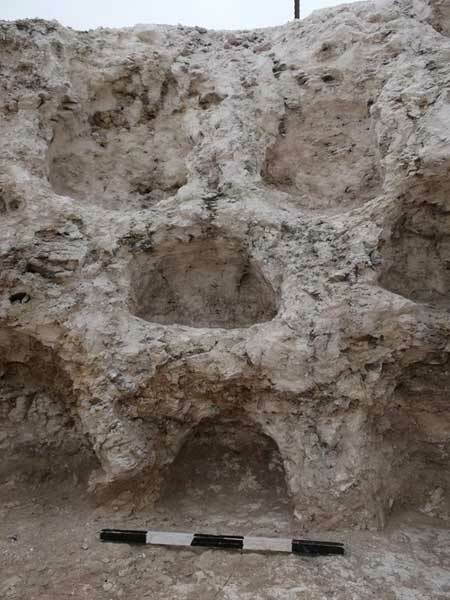 Several excavations conducted in recent years near the current excavation area revealed agricultural installations and an ancient road (Be’eri 2014), a columbarium (‘Adawi 2015), a rural settlement from the Second Temple period (Permit No. A-7148) and a farmstead from the Byzantine period (Permit No. A-6959). The remains of a rock-hewn columbarium were exposed in the current excavation. The columbarium (L11; diam. 3.3 m; Figs. 2, 3) was hewn in the soft bedrock that is indigenous to the area. Its ceiling and eastern part were destroyed by mechanical equipment during construction work. The western part of the columbarium was preserved to a maximum height of c. 1.2 m and consisted of three rows of 27 small rock-hewn niches (0.3 × 0.3 m, average depth 0.2 m; Fig. 4). Twenty-four bones of a rock dove were found in situ in one of the niches, thus indicating that doves were raised there (T. Shadiel, pers. comm.). Below the niches and around the installation was a low hewn step (width 0.5 m, height 0.2 m) and the floor of the columbarium was hewn beneath it (L12). Only a few non-diagnostic pottery sherds were discovered in the accumulated earth fill inside the installation (L10). Columbaria are a well-known phenomenon from surveys and excavations conducted in the Judean Shephelah, particularly in Ramat Bet Shemesh. They were used for a long time, especially in the Hellenistic and Early Roman periods, primarily for raising doves for food, to produce fertilizer and for ritual purposes (Zissu 1997; Dagan 2011:265–273). This columbarium was probably part of the agricultural system of the nearby village discovered at Horbat Zanoah. Numerous finds related to agricultural activity were discovered at Ramat Bet Shemesh. These finds are usually connected to large settlement sites. ‘Adawi Z. 2015. Ramat Bet Shemesh, Khirbat Umm edh-Dhiyab. HA-ESI 127. Be’eri R. 2014. Nahal Zanoah. HA-ESI 126. Dagan Y. 2010. 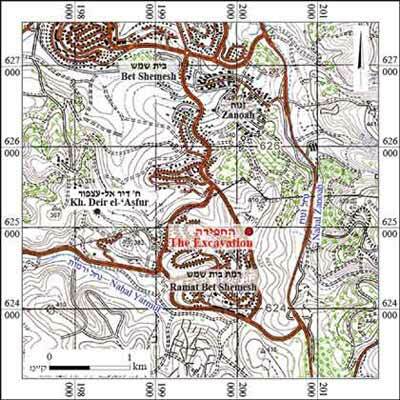 The Ramat Bet Shemesh Regional Project: The Gazetteer (IAA Reports 46). Jerusalem. Dagan Y. 2011. The Ramat Bet Shemesh Regional Project: Landscapes of Settlement; From the Paleolithic to the Ottoman Periods (IAA Reports 47). Jerusalem. Nagorsky A. 2008. Horbat Zanoah, Development Survey in the Region. HA-ESI 120. Zissu B. 1997. Two Herodian Columbarium Towers at Khirbet ‘Aleq and Khirbet Abu Hof. Qadmoniot 112:100–106 (Hebrew). 3. The columbarium upon completion of the excavation, looking west. 4. The columbarium niches, looking west.